Its been a strange 3 years here, while Fiberific has been running for 6 coming up to 7 years, I started this endeavour out offline. I used social media but did all my sales in person on Facebook. I realised very quickly (3 years is quick right?) that I needed a better way to get these awesome products in your hands, so that I could spend time dyeing yarn and making blinglets, and videos… How much do you like the vids? I like them a lot…So I got some help in setting up, and just dove in head first… there have been some glitches and many a typo over these few years, but I think just maybe, I might be getting the knack of it. 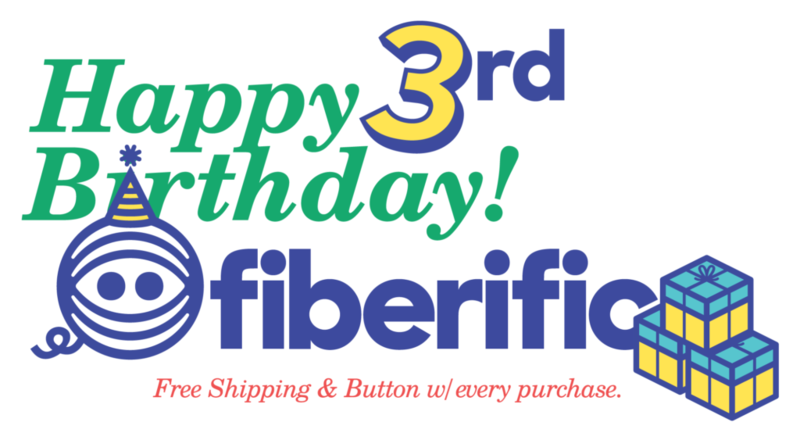 This special week also signifies the very first Fiberific Yarn Club shipment. I have worked very hard to make an awesome collection of goodies and I hope those that have subscribed to the Mystery Lace Club enjoy their forthcoming squishy mail. Well its time for me to get on, don’t forget nab your free post and button!